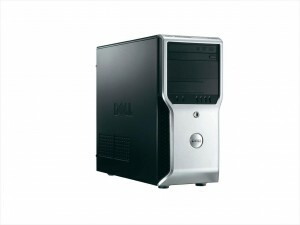 Bargain Hardware offer you this cheap refurbished Dell Precision T1600 which integrates power and performance with exceptional value. The T1600 combines professional grade CPUs and graphics with ISV certification and excellent reliability dependability in a compact toolless chassis. This “configure to order” entry level workstation will boost your productivity while helping you stay well within your budget. The T1600 takes Intel Xeon E3-1200 series or 2nd generation Intel Core processors with Turbo Boost mode and Intel Integrated HD Graphics running on the Intel C206 chipset. 4 DIMM slots take up to 16GB 1333MHz non-ECC memory, and there are up to two 3.5" SATA LFF drive bays or up to four 2.5" SATA LFF drive bays. Networking is provided by an integrated Intel 82579LM Gigabit LAN controller, and the system takes a wide variety of external video cards from ATI and Nvidia. Professional refurbishment by Bargain Hardware means you can count on the Dell Precision T1600 tower for a long life of reliable service combined with easy repair or upgrades. Configure your T1600 using our “configure to order” options, or contact our friendly and knowledgeable sales people by clicking on the contact button.